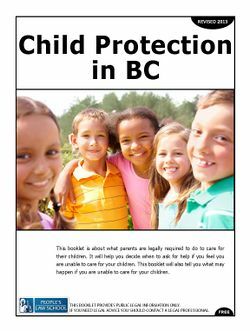 Child Protection in BC from People's Law School is about what parents are legally required to do to care for their children. It will help you decide when to ask for help if you feel you are unable to care for your children. This resource will also tell you what may happen if you are unable to care for your children. This page was last edited on 26 November 2014, at 14:50.